QRM Institute Barcelona is the official centre for the dissemination of agile operation strategies and Quick Response Manufacturing in Spain. It is also one of the proud founding members of the European QRM Institute network. 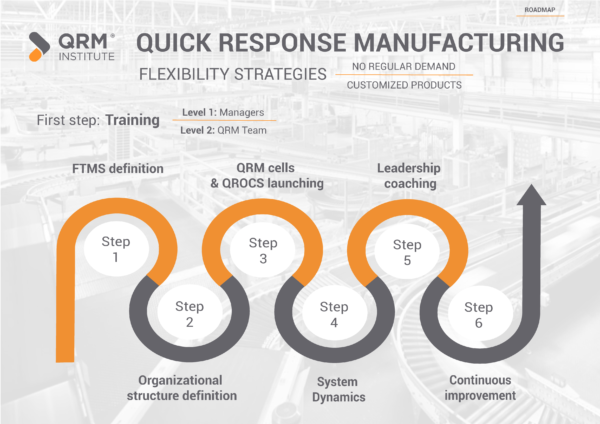 QRM Institute consists of a group of professionals, experts in industrial operations, who specialize in setting-up agile organizations and high performance teams. A special incidence in the improvement and the involvement of the teams. The QRM Institute Barcelona team has developed three advanced tools to make the evaluation of the current situation more easy and defining the right strategy in order to improve it. 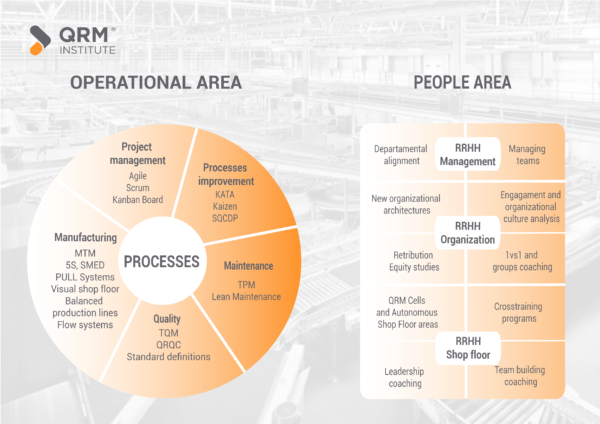 QRM Institute Barcelona has created the InTalent profile platform, and its objective is to provide a tool that assesses the knowledge and skills of engineers working in industrial environments objectively. It allows the engineers to know their role and ideal area of responsibility: leadership style, team players or not, knowledge, competencies and implication. QRM Institute has created the InTalent organizations platform. Its objective is to provide a tool that objectively assesses if your organization is focused on the right things and on the right practices. It also provides the appropriate climate in order to allow the personal and professional growth of your teams. Such as: ethics, clarity, professionalism, completeness, trust environment, customer focus, self-management, etc. It allows companies to develop healthy policies in order improve their teams results, and to attract and keep the best professionals. The INCO-I tool is a system created for QRM Institute Barcelona, in order to provide industrial companies with a solid strategic foundation. For them to design and execute an operational improvement plan that is perfectly aligned with the business plan. The methodology consists of only two sessions of 2 hours each. Due to this tool, your company will easily understand its winning factors and qualifying factors: cost, quality, service and flexibility. Additionally, it will become fully apparent which operational methodology will fit your company better: Lean? QRM? QRM Institute specializes in training for industrial managers, engineers and technicians. We have standardized programs and provide customized training, tailored to each unique company. Mostly focused on QRM, continuous improvement training, leadership and soft skills. We design and provide online, face-to-face and in-company training programs. In 2018 QRM Institute Barcelona created a new division called Proach, which specializes in HR consultancy and selection services. The QRM methodology has a lot to do with the improvement of the soft skills (trust, self-management, poly-valence, etc. ), so the support of the Proach team to the QRM projects is key in achieving the best results. Advice and support in deﬁning and improving the organizational structure, people management and the development of their competences.